I am re-blogging this post from the eloquent woman who represents the Gullah/Geechee people on St. Helena and the surrounding Lowcountry. Her reactions to the storms that have overtaken South Carolina are worth considering by all of us. I have spent the last week engaged in an activity that I and others in the Gullah/Geechee Nationfind ourselves in the midst of during the hurricane season annually-staying tuned to the Weather Channel. I found myself truly engaged in social media for up-to-the-minute accurate coverage from people literally on the ground or in the waters as rain fell and tides rose and we got flash flood warnings on TV, on cell phones, and from family and friends. I found myself truly appreciating and living the scripture 1 Thessalonians 5:17: “Pray without ceasing.” for I know that the “prayers of the righteous availeth much” and webe Gullah/Geechee anointed people. I found myself tuning my soul in as numerous spirituals came to mind and I realized that my elders and my ancestors had passed on this tradition that centers me in the midst of these times. After I made sure to check my own disaster preparedness checklist and insure that I had things ready, I reposted it and a video of me presenting it on social media. I settled in to my meditations and prayers and then into waiting and watching. Yes, watch as well as pray! As our prayers turned the hurricane completely into the sea and away from land, my soul was still not settled that there was not more to come. Within hours, this feeling was confirmed as the photos and videos started to appear and states of emergency were declared in the Carolinas. As I posted and prayed and checked the island for flooding, I thought of all the work that I had been led to do over the years to awaken people to how sensitive the Carolinas, Georgia, and Florida are to the various weather incidents, sea level rise, climate change, and ocean acidification dynamics that have been taking place. Some were willing to listen and a few have engaged in physical work to help us restore and protect the Gullah/Geechee Nation‘s coastline and even few have donated financially to the on-going work in this regard. However, there were the masses that did not see and feel what those of us whose hearts seem to be syncopated with the rise and fall of the tides along the coast are able to see. They literally needed a disaster to pay attention to what the “natives” have said in regard to not building where they build and not playing and recreating on sacred ground. Unfortunately, it took the national news to make folks sit up and pay attention and they started to do what happens time and time again-react. Massive amounts of folks tend to be reactionary and not pro-active which makes this literally rising problem that much more difficult to contend with. As I shook my head and resumed my focus to insure that I could reach people on the ground in various areas of the Gullah/Geechee Nation, a flood of emails came in to see how we were doing on the island. What folks were not discerning or believing was that the flooding wasn’t on the rural Sea Islands. It was taking place in the suburbanized, urbanized, and gentrified areas along the coast. The flooding from rainfall got coupled with midland South Carolina dams topping and some failing which sent water rushing down to the coast while the rivers that run throughout the Gullah/Geechee Nation began to swell and overflow onto land. The massive rainfall ended an extended drought due, but sewage and contaminants were now surfacing and flowing right along with waters that now filled and submerged roads, highways, yards, and homes. My mind went again to the work that the Gullah/Geechee Sustainability Think Tank has undertaken over the past five years and how we most recently have naturally or Divinely shifted our primary focus to seafood safety and human health. In a case like this, the human health of the Gullah/Geechee Nationpertains not only to how we will cleanup and restore the coast after this massive historic flooding incident, but how the Gullah/Geechee family is holding up mentally after witnessing and feeling the impacts of this. I prayed some more. Well, my prayers were answered when the sun came out and began drying out the land which led to people getting back online and responding to my messages to find out how families were in various communities. I heard positive messages from Gullah/Geechees who had all only dealt with minor flooding in Charleston County, SC and northward into NC. We started to mobilize and assess the damages to our institutions, businesses, and homes when another report of rain returning came in. So, it was time to again be still and watch as well as pray. The new rain fall was now an issue for Georgetown County due to the fact that rivers were cresting and dams were failing which would send water straight down to that county. The South Carolina counties listed as disaster areas started to grow and as the rain fell, the images and videos of flooding multiplied. As reports of all the personal losses emerged in the midst of this, I then started wishing that I could stop time and get all of the “Gullah/Geechee Alkebulan Archive” digitized and backed up in the cloud in one day. Time was truly of the essence as I saw the signs. The signs that I have been able to see spiritually for years were now manifesting themselves before my eyes and on TV and computer screens. I stopped and wondered if this would now be enough to get people to get involved in the environmental work that we are doing. I wondered if they would now pay attention to any of the numerous reports that predicted the loss of coastal and cultural heritage resources that would come through environmental damage brought on by weather, flooding, sea level rise, and climate science related incidents such as this. 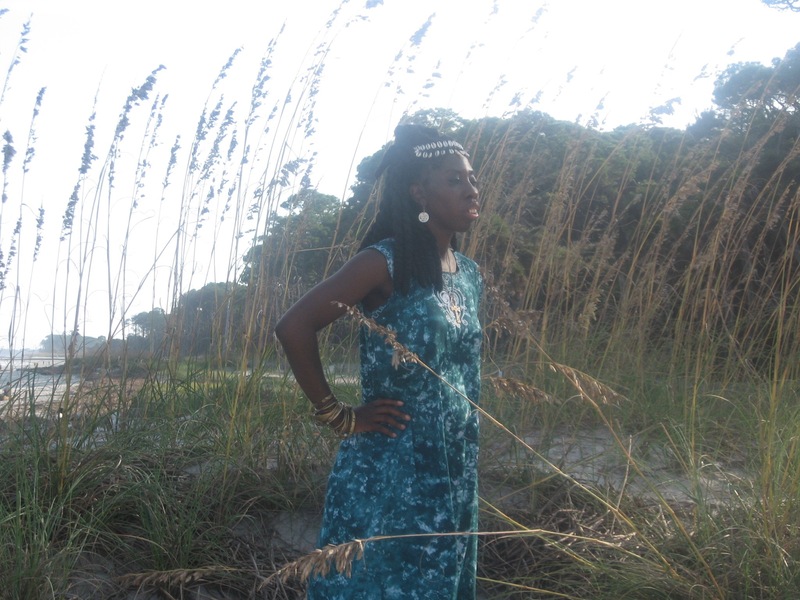 I wondered if the Gullah/Geechee Nation would ever get back in the headlines and on the news screen for us simply showing what we are doing to continue our culture and protect our cultural heritage resources along the coast or would people only remember that we were here when another disaster or tragedy took place-flooding, murder, etc. GOD forbid! Just as things started drying out a bit, it rained again yesterday and folks paused, breathed, and prayed. The biggest thing I took note of was that once again we stayed. We stayed at home on the islands and in the Gullah/Geechee townships with family and friends. We held together as a community and we’ve drawn on our cultural traditions to protect ourselves during the storms and to now bring ourselves out of the storm and to a higher level of consciousness in regard to how we will now continue to protect ourcultural heritage resources as the weather continues to change. One thing for sure is Gullah/Geechees will once again weather the storm and we culcha ain gwine nowhey tall tall. No matter what flows in, it will not take us out! AMEN! It snowed in Memphis last night -- maybe the earliest snowfall on record, as reported to one dramatic pronouncement. The total was 1/10 of an inch, according to the weatherman. At our house, we could find the snow piled in little 1/2-inch drifts on top of a few shingles where the roof overhangs the house. We found it in the flowerpots and under the hedge (a scrawny hedge). And we saw its leavings in a puddle in a low spot in the driveway. But it hardly ever snows in Memphis. Last year, we had NONE. The year before, there was one little snowfall that disappeared by noon. Storms from the west usually split at Memphis and go north and south of the city. Storms dropping down from the north? They go slanting off to the southeast of us. I have lots of boots that have never been wet, and we no longer own a snow shovel. It just doesn't snow, here. Until it does! And then what chaos ensues. The weathermen missed it. The highway department wasn't ready. The traffic cops were off duty. And it snowed, and sleeted, and the temperature dropped to 31 degrees, and everything froze. You also need to understand that around here, the traffic-related weather problems tend to be caused by hard rains, so the roads are built with a hump in the middle, sloping off toward drainage ditches on both sides. But when those humps are covered with ice, everything--not just rainwater--slides off the road into the ditches. By the time I got up, at a perfectly respectable 7:30, the world had come to an end. There were 25 multiple-car accidents on the traffic report map -- not just more than two cars per incident, but 7,8, and 10 cars at a time. Three people were dead, and a child was on his way to the hospital (slowly!) after his school bus crashed. And the roads were parking lots. Traffic on the interstates was at a bumper-to-bumper standstill, and sometimes those bumpers were more than touching. There are two bridges that cross the Mississippi River at Memphis -- the only two bridges for 45-50 miles in either direction. They were both closed because of accidents blocking them. Traveling between Arkansas and Tennessee this morning? Wasn't going to happen! They did open one bridge around noon, and the TV coverage showed a few cars creeping over it at less than 20 miles an hour. I counted myself lucky. I could pour another cup of coffee and poke my toes deeper into my fuzzy slippers. But 1/10 of an inch of snow ruined the lives -- or at least the days -- of much of this city. How does this happen in 2014? And what on earth would these people do if we suffered the blizzards that much of the country is experiencing today?